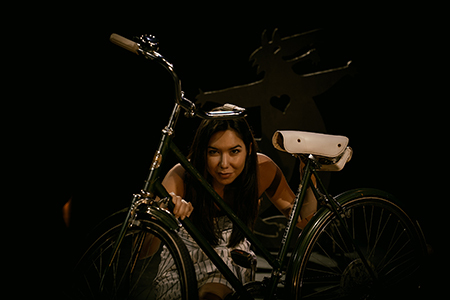 In Spirit is part of this year’s Rutas Panamericanas |Panamerican Routes presented by Aluna Theatre in association with Native Earth Performing Arts at the Aki Studio Theatre. This particular work is also part of NEPA’s 2013/ 2014 season. Written and Directed by Tara Beagan, former Artistic Director of NEPA, it is no wonder that In Spirit has such a great production quality. The team for In Spirit reads like the who’s who of top Canadian artists. What would it be like to die? Or be murdered? These are pretty morbid questions, but they must have been asked at some point during the creation of In Spirit. This work is told from the perspective of a 13 year old little girl. It follows her journey rediscovering the events of her death. Being very grown up and mature, the girl relates stories to us about when she was little. About puppies, being nice to people, and going to school. The dialogue is wonderfully written, crafted, and acted. At times I could hear my young nieces saying some of that to me. The girl is empathetically played by Sera-Lys McArthur, whose mannerisms capture that of so many children trying to be so hard to be grown up. Beagan’s writing is approachable and inviting allowing the audience to fully take in the implications of the work. The play opened with a news clip of Peter Mansbridge for the CBC discussing Harper’s cold to non-committal remarks regarding an inquiry into the over 800 missing or murdered Aboriginal women. The clip set the scenario for what was to come. By the end of the work we find out the era of this little girl’s story. Juxtaposing a current news story with one from the 70s drives home the message of this work — these murders and abductions are still going on. In Spirit has one of the best integration of projection and sound design that I have seen for a very long time. Andy Moro created a design that was not intrusive yet both the sound and the projections played an integral part to the work. His design aided the stories that the little girl was telling us about, flashing an image of trees, or hearing the sound of a truck at precisely the right moment made the girl’s anecdotes come to life. These tidbits of non verbal information made it feel like we were in the girl’s mind remembering with her, rather than being mere voyeurs. In Spirit is a very touching piece, not only for the content, but also because of how we were transported into to this little girl’s world. It seems fitting that this play straddles International Womyns day. It is a refreshing change to see a play tackle a societal defect without hate and guilt. Through love and empathy it reminds us of the missing women and the horrors that are still taking place in our county.